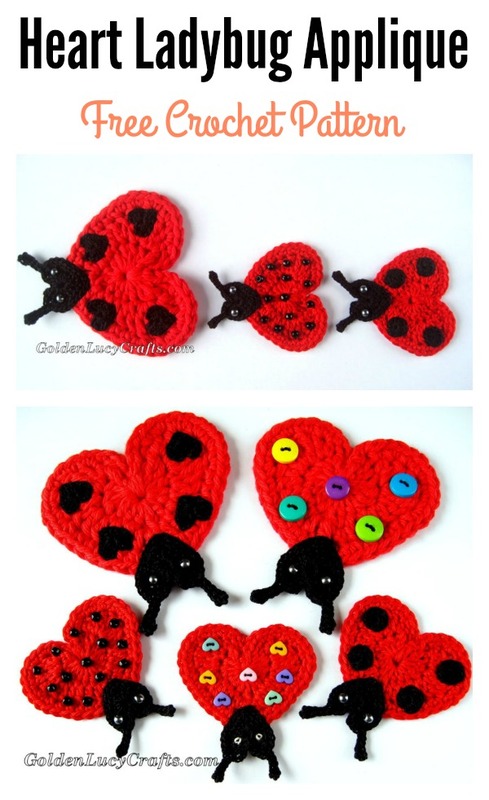 This Heart Ladybug Applique Free Crochet Pattern can be used in a wide variety of projects such as scrap-booking and card making. It is easy to make. It requires very small amount of yarn and perfect for any embellishment. You can sew them on hats, bags, clothes, pillows. They would be perfect to decorate skirts, blouses, sweaters, scarfs etc. This is also a great gift for Valentine’s Day. You can experiment with different size yarn and hooks to make your Ladybug in different sizes. Feel free to use different materials for the Ladybug spots. Enjoy. You might also like Free Amigurumi Ladybug Keychain Crochet Pattern.